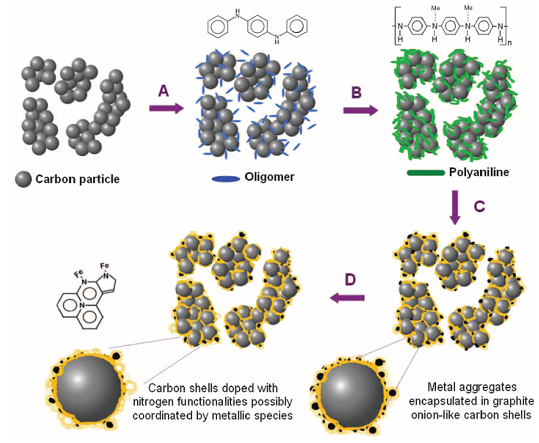 We have investigated the atomic structure of InAsPSb, a mid-infrared alloy consisting of binaries with highly mismatch bond lengths, using P K-edge and In K-edge extended X-ray absorption fine structure (EXAFS). 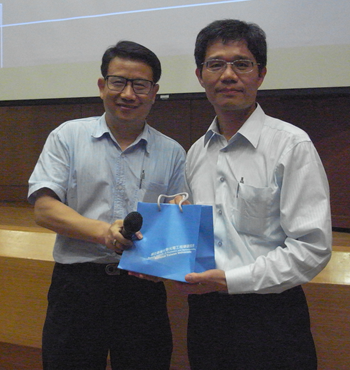 The alloy with wide composition range, grown by gas-source molecular-beam epitaxy, were measured, in collaboration with Prof. Zhe-Chuan Feng, at National Synchrotron Radiation Research Center. 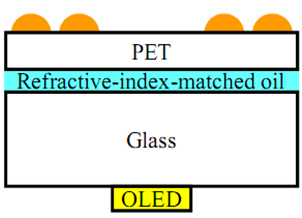 The InP bond length determined from the P K-edge EXAFS, shown in Fig. 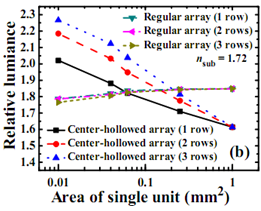 1, is virtually independent of alloy composition and lattice constant, which is in conflict with the virtual crystal approximation and Vegard’s law and is very close to Pauling’s model. 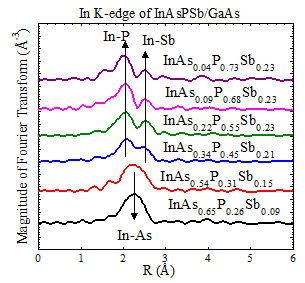 The In K-edge EXAFS, consisting of signals from InP, InAs, and InSb bonds, is shown in Fig. 2. 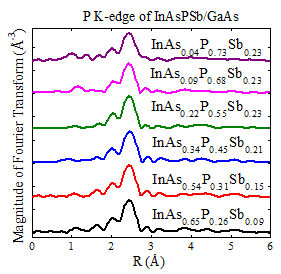 For the samples with low As composition, two separate peaks representing InP and InSb bonds are evident. When the As composition increases, the peaks gradually merge into the rising InAs signal. We used a model based on valence force field (VFF) theory to fit the EXAFS. 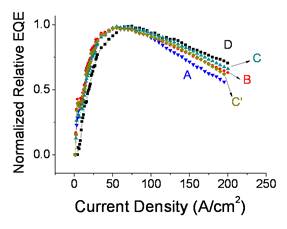 The result shows that with the increase of As mole fraction, the dominant In-centered basic unit cell in the alloys changes from cell with 2 P and 2 Sb to cell with 4 As and finally to cell with 2 As, 1 P, and 1 Sb. 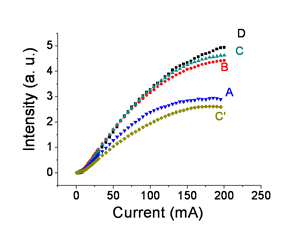 VFF calculation indicates that cell with 2 P and 2 Sb has higher bond distortion energy than the other two cells, which explains the immiscibility behavior we observed in previous studies. Fig. 1 Fourier transformed P K-edge EXAFS signal of the InAsPSb. The InP bond length of the samples is virtually fixed. Fig. 2 Fourier transformed In K-edge EXAFS signal of the InAsPSb.